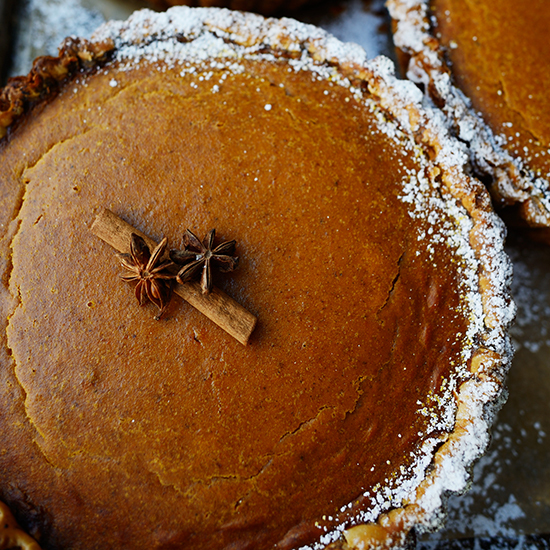 Lots of people use canned pumpkin to make pie, but would a pastry chef? Brooks Headley, the genius at Manhattan’s Del Posto, explains why his answer is an unapologetic yes. Thanksgiving is my No. 1 rule-breaking holiday. Some people pick Halloween or New Year’s Eve; I choose Thanksgiving. This is how a pastry chef breaks the rules at Thanksgiving: I use a lot of food from cans and packages. Sure, you can prepare cranberry relish with minimal effort (except for digging out the meat grinder you otherwise use once a year; it happens to be great for crushing cranberries). But no chef I know—and I know a lot—makes every single thing from scratch on Thanksgiving. Like me, they prefer cranberry sauce from the can. How else do you get that perfect slab? I’ve also tried every version of homemade pumpkin pie—using kabocha squash, caramelizing pumpkin cubes—but it comes out best when I use the canned stuff. On Thanksgiving, I also prefer jarred herbs over fresh. When I started cooking professionally, I would come home for the holiday and see my mom with jars of dried sage and thyme. “Mom,” I’d say, “I can bring you fresh herbs.” I was like all the kids who start cooking in restaurants and feel the need to show off. My mom just told me, “Chill out.” And I realized that dried herbs make stuffing taste like Thanksgiving. I break personal, self-enforced rules, too. Even when I was a hard-core vegetarian—when my girlfriend and I would go around the kitchen like detectives making sure there was no poultry stock in the gravy—we’d sneak back in at night and scrape up the carbonized bits of turkey stuck to the Pyrex dish. We’d go back to being vegetarian on Black Friday—but that was still a couple of hours away.—As told to Kate Krader.